Skagway is our longest stop on the cruise and is a historic Gold Rush town that has been preserved to appear as it did in 1898. Reminds me of visiting Old Sydney town when I was about 5. Skagway claims to have invented the board walk in an attempt to keep mud out of the shop fronts. Speaking of shopfronts, on entering Skagway I commented to Gemma that buildings all had false fronts or facades much like a movie set. Initially we thought this was to provide the illusion of being in the late 1800’s however, our tour guide later that day explaine that this was actually historically acurate. Skagway began as a tent city and some stores/resturants errected false building fronts in front of their tents to give the impression of a more classy establishment. Some of the buildings even have given the impression of additional levels through the facades. 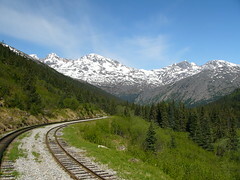 The gold rush in Skagway lasted all of 3 years between 1897 – 1901. Skagway has survived ever since as a tourist attraction drawing visitors to the White Pass Railway which transported gold seekers from the sea port to the gold fields in the mountains 3000ft above. This brings us to our shore excursion. At 9am we departed aboard the last carriage of the White Pass rail. The steam engine has been replaced with a diesel motor but the carriages are authentic. The railway was fantastic. Starting at…well sea level and climbing to just under 3000ft in about 15 miles is an experience. To think that the tunnels were carved from the solid granite mountain by hand over 100 years ago seems impossible. However considering the alternative of dragging food, tools and other supplies up the mountain by hand justifies their labours. You can ride the railway to Yukon which is well into Canada but is a 6 hour return journey. We opted to take the 3.5 hour trip that takes you to the peak (which is also the Canadian border) and then turns around. We choose to do the trip in the morning as we thought the ‘evening’ summit may not provide as good photo opportunities. I guess we forgot that the sun sets at 11:45pm here. Once back in town we had a bite to eat then took a free guided walking tour of historic Skagway provided by the parks and wildlife authority. They actually buy and restore historic buildings and then rent them back to the retailers for a tidy profit. A government authority that seems to be doing quite well and giving back to the community? We finished off the day with a drink in a Saloon on the mainstreet. Having the longer time makes for a much more relaxing experience. Check out the photos to see more. Judging by the photos and postings you’re having a great time. The scenery is breathtaking. Couple of questions – What was the mean age of your fellow cruise ship passengers? And did you club the seal in the photo to do a deal? Went to the Australia v England test at the Olympic Stadium on the weekend, Aust won easily in the end, but it was a pretty ordinary game, and yes Simon, our scrum is still crap. Australia is swept up in World Cup fever after a 3-1 victory over Japan early this morning. how many names do you have George? mean age of cruise was probably about 80 until we got on board. Good news on the rugby, there is plenty of coverage of the soccer over here though. PS. What does George have against seals?